Contest: $500 shopping spree at Lamps Plus. $500 shopping spree at Lamps Plus. This contest replaces an older contest. 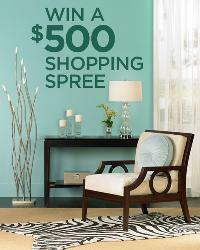 Prize: Every 4 months we select one Grand Prize Winner to receive a $500 shopping spree at Lamps Plus. Statistics: This contest was opened by 47 and entered by 5 ContestChest.com members. 11% of those who opened the contest, entered it.